What if you left the rice out of the sushi? My chicken sushi recipe was inspired by a sushi restaurant on Greenwich Avenue that I used to go to back in the late 80s; I forget the name. They served a dish called “Tiger’s Eye.” It was a green bean and carrot wrapped in nori, then wrapped in salmon, wrapped again in nori and stuffed into squid body and steamed. When you sliced it, it looked like an eye, not necessarily from a tiger, but Tiger’s Eye sounded much better than Human’s Eye on the menu. I like the idea of sushi without rice, so I made chicken sushi, which I’ve been making for years. It looks really cool when you plate it. It scares people a little when you tell him you’re bringing chicken sushi, but then they see it and they get it and they light up. I made this dish for a potluck last year, where I stuck skewers in each roll and made “Sesame Chicken Sushi Pops w Teriyaki Glaze & Scallion Ginger Oil.” You know the effect of turning anything into something that resembles one of our favorite childhood treats, don’t you? More DELIGHT! Put a stick in it and they will come. LOL! I love that this dish is also low-carb and gluten-free, as long as you serve it with gluten-free soy sauce. I totally agree, raw chicken sushi would definitely be GROSS! And that’s not what I made, but I do like calling this recipe for baked nori wrapped chicken breast rolls stuffed with veggies “Chicken Sushi” because people get a very curious look on their faces when I say it. It’s definitely something unexpected. Use gluten free soy to make it and you have a gluten free and low carb appetizer. Poke a skewer in it to serve them and they become Chicken Sushi Pops and they are even more curious and delightful. Spray a small sheet pan with cooking spray. Set aside. Prepare sushi mat by wrapping it in plastic wrap. Prepare chicken breasts by slicing them thinly, placing them between two pieces of waxed paper or a heavy duty plastic bag and banging them out with the flat side of a meat tenderizer or meat hammer to make them flat, about 1/4” thick. Have your vegetables for the stuffing ready. 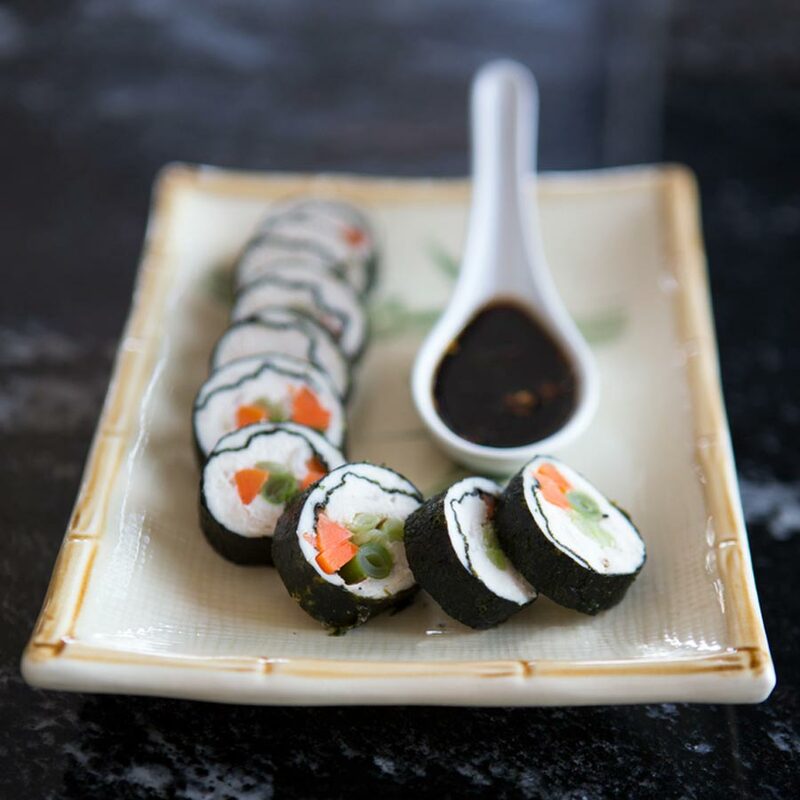 Place a nori sheet lengthwise on the sushi mat with the shiny side down. Starting from the bottom, lay the chicken breast, evenly, on the nori leaving a 1” band of the nori uncovered on the top of the sheet. Season chicken with salt and freshly ground black pepper. Place contrasting colored vegetables one third up from the bottom of the nori sheet which is the side closest to you. I use three types of vegetables for each roll, making sure they extend from one side to the other with a little overhang. Don’t overstuff them. Being careful to keep the vegetables in place, lift the mat and roll the nori over the vegetables and squeeze the curve so it’s tight. Using the mat to guide you, roll the rest of the nori up tightly, slightly dampening the nori edge if necessary to seal it, but you may not need to because the chicken is sticky. Line sushi rolls on sheet pan seam side down. Bake for 15 - 20 minutes until the rolls are firm and cooked through. Yield: 4-6 rolls depending on how you stuffed them. Use whatever vegetables you like for stuffing your chicken sushi. I like to use contrasting colors so it looks pretty. I usually serve them as an appetizer, but you could also serve them as part of the salad with greens. A sauce for dipping chicken sushi, dumplings and other Asian appetizers in. It’s gluten-free if you use gluten-free soy sauce.